A well designed drainage system is crucial for the upkeep of any landscaping project. Green Tek Landscapes can evaluate your specific situation and accommodate accordingly. With either a French drainage system or a surface water solution, we will be able to find a lawn drainage system that works for you and your home. 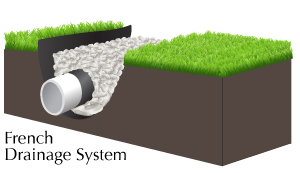 Contact us to today to figure out the best drainage system for your yard!